Though the three-time RBI champion was team captain of the Philadelphia Phillies in 1909, Sherry Magee obviously wasn't famous enough to prevent having his name misspelled on his portrait card from the T206 issue, creating one of the rarest variations in sports card history. Because the error was quickly discovered and corrected before the first run of "150 series" cards were released, the number of "Magie" cards in existence is thought to be slightly over 100 total copies. 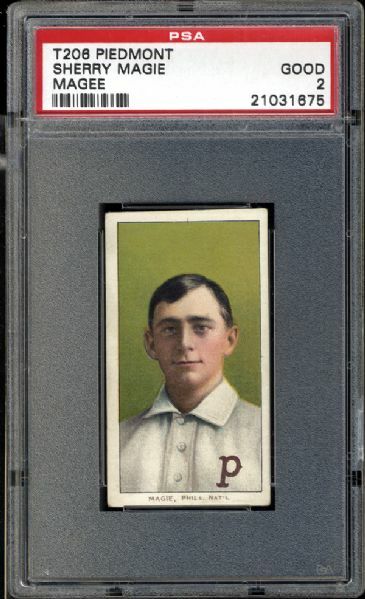 Along with the other members of the "Big 3" (Honus Wagner and Eddie Plank), the "Magie" is so rare that it isn't considered part of the regular set and rarely ever comes up for auction. But if you're a T206 aficionado, today is the day you've been waiting for! The offered specimen is graded PSA 2 but looks every bit as good as any PSA 5 you'll ever see. Possessing VG/EX to EX/MT features in virtually every respect, PSA's final assessment is based on slight paper loss on the bottom edge of the reverse that is apparent due to missing lettering next to "Factory No. 25," hardly objectionable to even the most discerning collector. The central image is superb, with a robust green field providing the backdrop for Magee's portrait, which is so finely detailed that you can actually see the individual hairs through the light reflecting off of his head. 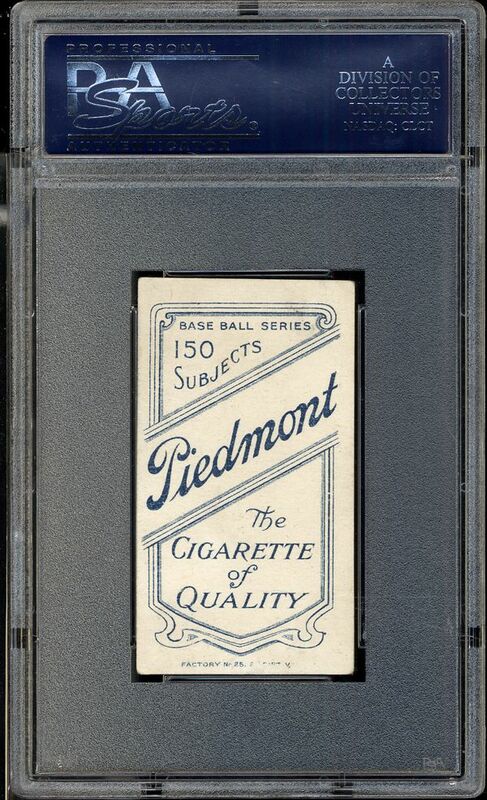 Given the overall appearance of the card and the grade by PSA, we can't possibly imagine a better opportunity to own one that looks nearly as magnificent in this grade. You've always dreamed of owning a genuine "Magie" variation, the time has come to go get it! Auction closed on Friday, June 7, 2013.